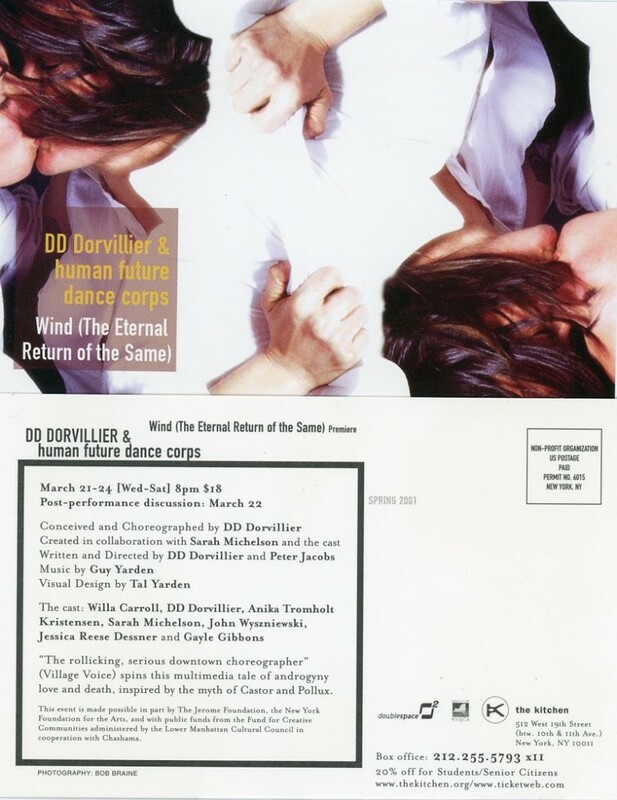 DD Dorvillier used the Greek myth of Castor and Pollux, the infamous twins represented in the constellation Gemini, as a starting point in her choreography for Wind (The Eternal Return of the Same). She and Sarah Michelson played Pollux and Castor (respectively) alongside an ensemble of schoolgirls and tutu-clad furies played by Willa Carrp, Anika Tromholt Kristensen, Gayle Gibbons, Jessica Reese Dessner, and John Wyszniewski. The dance, built from practices in contact improvisation, mixed postmodern elements of gender subversion and absurd imagery with ballerinas in pointe shoes and ancient Greek myth. By mixing the classical with the contemporary to tell the story of two brothers destined to fly between heaven and hell, DD Dorvillier called attention to the historical polarities of dance as a medium.